A memorial ceremony was held for Private First Class Clifford Mills yesterday at the Jasper Armory. Mills fought and died during Operation Market Garden in World War II. His remains were lost in the battle, but recently they were uncovered and found in Belgium. So now, PFC Clifford Mills gets to come home. 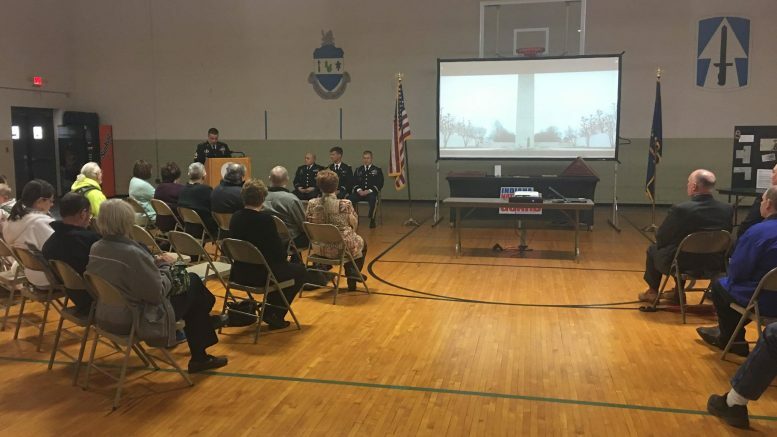 The ceremony was led with a background on Mills and his battalion, followed by the presenting of the Purple Heart Medal and the World War II Service Medal to the remaining family of Mills. Former Jasper Mayor Terry Seitz spoke on behalf of US Senator Mike Braun extending his condolences to the family. The ceremony concluded with a video of a Flag folding ceremony at the US Margraten War Cemetary in the Netherlands. Private First Class Clifford Mills was a member of the 82nd Airborne, 319th Glider Field Artillery Battalion. After being MIA for 75 years, his remains were found and identified on February 22nd in Belgium. Mills will be gifted a funeral service will full military honors. Mills’s funeral service will be held on March 30th at the Zoercher-Gillick Funeral Home in Tell City. Visitation will be from 9:00 AM to the 11:00 AM funeral service. Mills’ remains will then be taken to Troy Cemetary to be buried next to his wife, Ethel. Be the first to comment on "Ceremony For Fallen Solider Results in Presenting of Purple Heart and Other Awards To Family"